This step in the finishing operation is the most important in producing a true plane surface and takes place immediately after the spreading of the concrete. It must be completed before excess bleedwater appears on the surface. There are a wide variety of screeding tools-both hand tools (wood and magnesium) and mechanical tools (vibratory, oscillating, and roller). The important thing for this discussion is what they achieve and when screeding must be done. Purpose: To strike off freshly placed concrete and make it as level as possible before finishing. What's available: You can use a simple wood 2x4, or purchase hollow aluminum or magnesium straightedges. Metal straightedges are available in various lengths (from 6 to 24 feet) and cross sections. Wood straightedges should be straight and warp-free. Otherwise, they can leave undesirable ruts or crowns in the concrete surface. Magnesium and aluminum straightedges are lighter than wood and won't warp or bow. They also are easier to clean because concrete won't stick to them. Buy metal straightedges with capped ends to keep out wet concrete. Some tools have wooden or plastic plugs in the ends, but these can fall out and allow the concrete to enter. Tools with welded metal end caps are a better bet. For more comfortable grasping, look for straightedges with kerfed edges that won't dig into your hands during use. You can also find keyhole-shaped straightedges with flat bottoms and rounded tops for easier gripping. To help you gauge surface slope as you work, consider buying a straightedge with built-in or clamp-on bubble levels. For large jobs, such as commercial slabs, consider a power screed. Learn more here. Average costs: The cost for a wood 2x4 will be nominal and you might be able to use a piece of lumber you already have on the job. 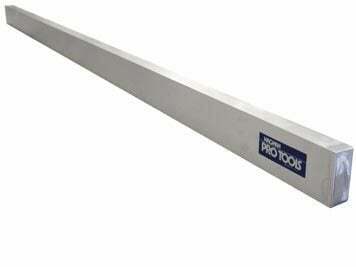 A 2x4 magnesium straightedge goes for about $75 (6-foot length) to $300 (24-foot length). Premier Magnesium Screed Capped on each end to prevent concrete from getting inside. Magnesium Straight Edge High Purity Steel. Lighter than aluminum. Buckeye Concrete Float Bring your concrete to surface grade. Comes with level vial.